Singapore To Get New Posterboy For Entrepreneurial Success? The room was totally packed at the keynote presentation in BlogOUT! ’09, but you can’t truly be sure what the crowd was here for. 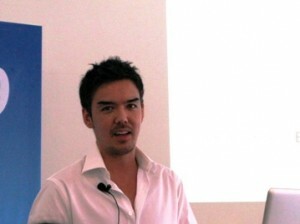 Jon Yongfook Cockle, a Tokyo-based blogger and web producer who recently sold his recipe social network Open Source Food to Tsavo Media, was speaking about how to turn a blog into a business. A subject topic that’d appeal to most bloggers during such shattered economic times, but that’s probably not what enraptured the crowd. It was because he was just that dastardly good-looking, and so very eloquent. Judging from the gasps and sighs emanating from the crowd, it’s unlikely that the girls heard a single word of what he said. Twitter was all a-flutter about how cute he was. He has male fans too, of course. Howie Chang, president of The Digital Movement that organized BlogOUT! ’09, calls Yongfook his idol when it comes to “design and user-interfaces”. Yes so that makes him both talented and good-looking, and therefore easy to hate. In his presentation, Youngfook shares why he thinks advertising as a revenue model is very limiting for blogs and highlights some of the other ways blogs can be monetized. What you may not know is that Yongfook graduated with a finance degree, just because his mom made him get one (she’s Singaporean after all). So he should know a little about making money. These days Yongfook amuses himself as the CEO of Egg Co, a business incubator that looks at working closely with digital startups. He is also about to launch Rippl3, a social media campaign measurement service. The good news for the ladies, is that the half-Singaporean is looking to relocate to Singapore in the near future. When that happens, we’ll get our new posterboy for entrepreneurial success.